Abinger Court occupies a prominent and most central position on the north side of Gordon Road, virtually opposite the junction with Longfield Road and bordered on the east side by the leafy Longfield Walk that links to Castlebar Road. Hugely convenient for the multiple shopping developments in The Broadway, and a five minute stroll across Haven Green to Ealing Broadway Station. First Great Western Service provides fast (10 minutes) access to Paddington and Heathrow Connect provides a frequent 20 minute service to Heathrow. Access to the West End (30 minutes) and the City (40 minutes) via the Central Line underground and Earls Court, Victoria etc via the District Line. Ealing Broadway Station is due to be redesigned to accommodate the new Cross Rail Service from Essex/Kent via the City, West End and Paddington to Heathrow and Maidenhead. Abinger Court was constructed in 1968 by the local builder, Percy Bilton Limited. Abinger Court, comprises 6 blocks each of flats over four floors, linked by two separate entrances. The entrance halls and staircases are carpeted and entry phone security is installed. 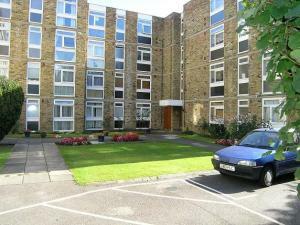 The flats are surrounded by gardens and each flat has either an allocated car parking space or a lock up garage. Each flat was sold with a Lease of 99 years from 25th December 1968. Following the acquisition of the freehold interest by the resident management company, "Abinger Court Residents Company Limited", the leases for the majority of the flats have been have been renewed with a term of 999 years, from 25/12/1968. Each leaseholder owns a share in the freehold.